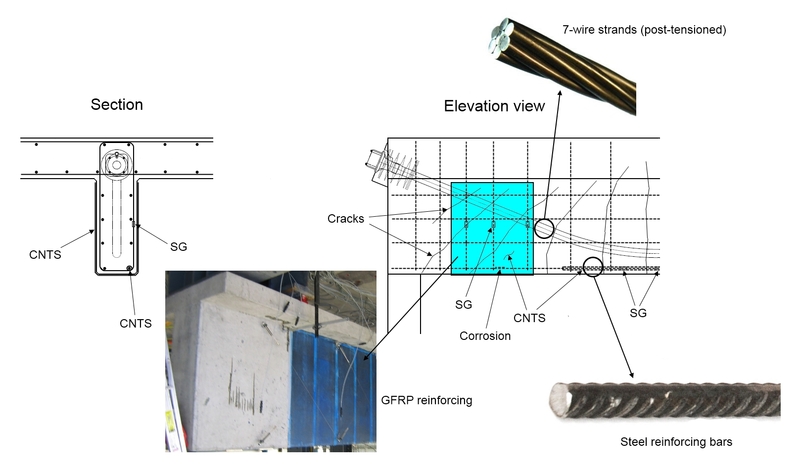 The primary objective of this project is to investigate the integration of carbon nanotube-based sensing technology into structural health monitoring (SHM) systems for civil structures and buildings. The sensing concept is based on utilizing electricallyconductive carbon nanotube networks integrated into the polymer matrix of a textile composite. Carbon nanotube sensing layers consist of a conductive network structure that enables nerve-like distributed sensing capabilities. These sensing layers can be functionalized and tailored to different applications for in-situ or ex-situ sensing. Carbon nanotube-based sensors have a number of unique characteristics as compared to traditional SHM sensors, such as strain gages, accelerometers, or displacement sensors, and are extremely well suited for distributed sensing. This novel sensing approach is (1) extremely sensitive to strain and micro-damage, (2) applicable to a wide range of geometries, and (3) robust and functional well into the non-linear structural behavior. Structures equipped with such a monitoring system would be safer, more reliable, and their life may be extended. Disclaimer: This material is based upon work supported by the National Science Foundation under Grant Number 1234830. Any opinions, findings, and conclusions or recommendations expressed in this material are those of the author(s) and do not necessarily reflect the views of the National Science Foundation. This entry was posted in Uncategorized on May 8, 2013 by Thomas Schumacher.